We loved this image of a Kit Yamoyo sign next to Coca-Cola: it’s a reminder of where we started, mimicking Coca-Cola’s techniques to make diarrhoea treatment as accessible as that famous drink. Since 2010, we’ve come a long way in Zambia. Much has changed, but we stay true to our underlying principles. 2016 saw the launch of our second scale-up project: KYTS-LUSAKA. Our manufacturing partner, Pharmanova, is now shouldering key responsibilities: liaison with 4 supermarket chains, costing and pricing, and wall painting of small shops in the compounds (townships) around Lusaka. While 2016 saw ColaLife hand off more and more responsibility to Zambian partners, we tightened up our management information and processes: harnessing the power of the tablet-based IT system we’ve built and moving to target-based management. And for 2017? We’re ready to move on other countries! Here are our Ten Top Achievements for 2016. 1. Switching to target-based management. OK – so our number 1 achievement sounds dry and techy – but what a difference it’s made! Each week, everyone gets a snapshot – a picture worth 1,000 words. 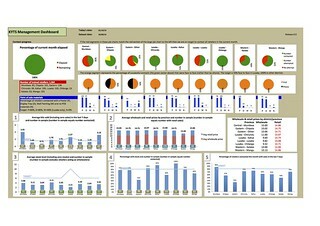 Field staff can see the difference they’re making, what is expected of them and how they are doing compared to their colleagues (see Dashboards as a motivational tool). Our project managers, Chibale and Albert, have – at a glance – all the information they need to manage their teams. ColaLife and our manufacturer, Pharmanova can track market trends week by week. And our funders can see the progress they are backing. It’s been a learning process – not an overnight sensation: we started in 2014, brought out the ‘dashboard’ in 2015, and in Feb-16 this year we brought all Keepers Zambia Foundation (KZF) field staff together to agree Key Performance Indicators (KPIs) and developed a commitment to be managed on this basis. 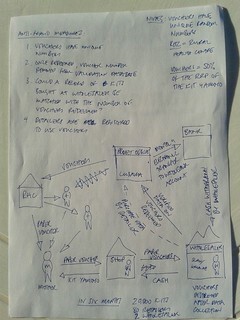 There have been some issues with this new system of working, but overall it has been transformational. As Chibale says: “It’s easy to commend and assist the field staff on specific strengths and weaknesses. I am sure that we can improve performance in this way. Even the driver comes in on Fridays to ask how the dashboard looks this week.” The dashboards are published here. 2. Pharmanova takes the lead! Zambia has only 4 pharmaceutical manufacturers, and it wasn’t easy to get one on board, especially as ColaLife was proposing, from the outset, an unfamiliar offer: ‘We’re not an NGO customer, buying to distribute. We’re not just going to buy while the donor budget is available and then leave. We’re your development partner, helping you to prove this new product and establish Kit Yamoyo in the market. Make it a success – and it’s yours.’ We’re not sure they believed us in 2010, but we’re doing it: by the end of 2016, we’d started the formal hand-over process for the brand in Zambia with Pharmanova’s lawyers. 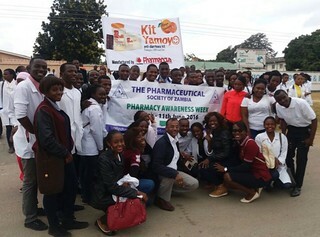 Launched Kit Yamoyo at the Pharmaceutical Society of Zambia’s AGM, conference and Pharmacy Awareness Week. Pharmanova staff also (mostly) remember, when we meet, to refer to Kit Yamoyo as ‘our’ product, not ‘yours’! 3. 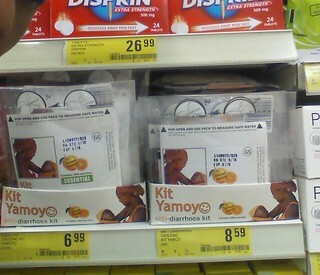 Four supermarket chains now stock Kit Yamoyo. At the end of 2016, Kit Yamoyo is on the shelves of four supermarket chains across the country. This is an incredible achievement. 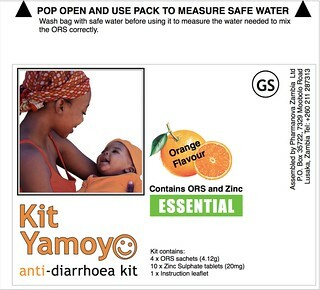 Only 3 years ago, our trial showed that 99% of cases of diarrhoea were not treated with ORS and Zinc (the 10 year-old international recommendation) due lack of access to a suitable product. Now a world-class product, produced in Zambia, affordable to the majority, is in most supermarkets in the country. ColaLife and our partner KZF have trained more than 1,300 small community retailers to sell it as well. We’ve still a long way to go. Most care givers still have not heard of Kit Yamoyo, let alone used it, but working through our two scale-up projects (KYTS-LUSAKA and KYTS-ACE), with Pharmanova, with new NGO partners (see number 10 below) and the Ministry of Health (see number 7), we expect to change that over the next 18 months. 4. ColaLife features prominently in landmark ORS/Zinc policy paper. We’ve always wanted to write an influential policy paper. But if you’re featured by other global influencers – even better! 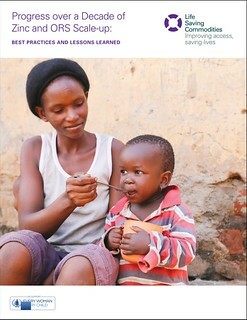 In mid-2016 the Every Woman Every Child initiative published a global policy paper on ORS and Zinc strongly featuring a range of our findings and learning. 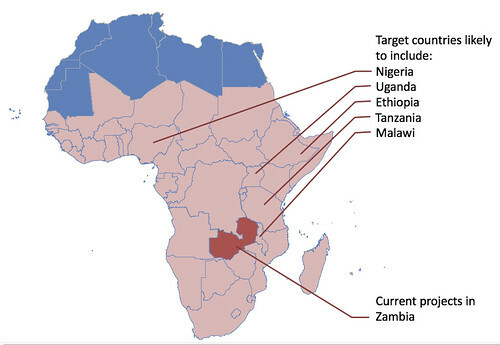 This was brought together by Clinton Health Access Initiative (CHAI) and is probably a ‘once-a-decade’ opportunity to share lessons on ORS/Zinc globally. We’re proud that our work is referenced more than 20 times in this report. use existing private sector supply chains. The full report can be downloaded here: Progress over a Decade of Zinc and ORS Scale-up (PDF 10.4 MB). 5. ColaLife develops its globalization plan with help from Ashoka. As the scale-up gets underway in Zambia, ColaLife is spending more time on spreading our impact beyond Zambia. To date this activity has been limited to our open access initiative: responding to requests for information from other countries, as well as ad hoc support to individuals. The Ashoka Globalizer on Health and Lighting supported us with four mentors, over 12 weeks, to produce a comprehensive plan for increasing our impact beyond Zambia. We presented this at the Globalizer Summit hosted by the Philips Foundation in Eindhoven in Oct-16. Our plan is now being refined for publication in early 2017 and will form the foundation of a new fundraising campaign. Our aim is to improve 2m children’s lives by 2020 and save 5,000. Thereafter, and without further external support, we expect 5,000 lives to be saved and 1m children’s lives to be improved every year as a result of our globalization programme. 6. KYTS-LUSAKA team in place. Although there was a delay in getting the KYTS-LUSAKA team in place, they have been incredibly effective. 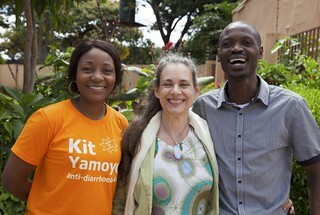 This is down to good leadership, the new ‘management by outputs’ approach and the fact that they are building on the learning and experience of our original trial, the longer-running sister project – KYTS-ACE managed by Albert Saka (also pictured), and our Zambian marketing guru, Ralf Siwiti. 7. Order for 452,000 ORS/Zinc co-packs from the Ministry of Health fulfilled. 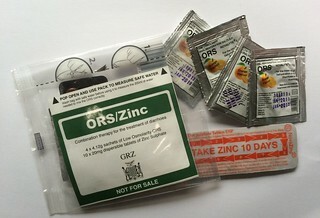 In Apr-15 we helped clinch funding via CARE for Zambia’s Ministry of Health to buy 452,000 ORS/Zinc co-packs from Pharmanova (see Order confirmed for 452,000 ORS and Zinc co-pack kits). 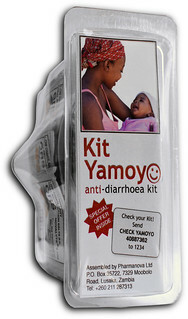 These co-packs are identical to the Kit Yamoyo ESSENTIAL product (see item 8 below) but with government branding. In Dec-16 Pharmanova completed this order, delivering the last batch of kits to the government’s medicines distributor – Medical Stores Limited (MSL). 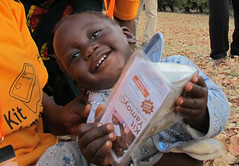 These co-packs are being distributed by MSL to the 14 districts in Zambia with the highest levels of child malnutrition and stunting. As well as plugging a gap in the medicines supplied to clinics, this massive order enabled Pharmanova to reduce the cost of production (and ex-factory price) of both the new GRZ product and the commercial format – Kit Yamoyo. 8. New voucher system launched. In Oct-16, more than 3 years after drawing this concept diagram for a voucher system to support the Kit Yamoyo scale-up, we launched a working system in selected compounds (townships) in Lusaka . So far, 29 retailers have been recruited and trained to accept vouchers and 5,500 vouchers have been distributed. We used vouchers in the first 6 months of the original trial (Sep-12 to Sep-13) but have not used them since then. The new voucher system builds on lessons learnt during the trial but seeks to achieve the same objectives: giving more caregivers the opportunity to try Kit Yamoyo at a reduced price while, at the same time, strengthening the existing supply chain systems. It will also help us track what kind of beneficiaries receive and use the vouchers. 9. 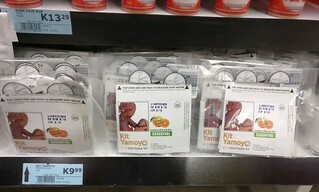 Local product development: launch of Kit Yamoyo ESSENTIAL. A key principle of our work is the relentless focus on product design to ensure we produce something affordable that caregivers want: an aspirational way to treat their children. We took the original multi-award winning AidPod through a complete design review following the trial (see How the ColaLife trial findings have influenced the design of Kit Yamoyo). This gave us the ‘flexi-pack’ design: with the same product benefits, desirability and function – but as cheap as Pharmanova could make it. Unfortunately, the Zambia Revenue Authority ruled that the kit was VAT-able as it contained hand-washing soap (see Costing and pricing in the real world: the VAT issue, inflation and affordability). This led us to develop a second flexi-pack format called Kit Yamoyo ESSENTIAL: the same as the original but without the soap and without the VAT (see Pharmanova launch new Kit Yamoyo format and reduce prices across the board). The original AidPod was phased out with the last batch of 1,000 kits leaving the Pharmanova factory in Sep-16. We were very disappointed to drop the soap, but 2017 will show us how each product performs. 10. NGO partnerships within Zambia develop. 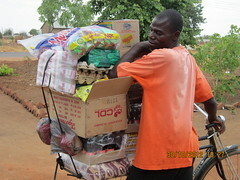 This image shows the ‘product bag’ of a ‘Health Entrepreneur’ trained and supported by the ‘Live Well’ project. Notice Kit Yamoyo in the top of the bag. ‘Live Well’ is a newly established social enterprise in Zambia that runs a network of ‘Health Entrepreneurs’, who go door-to-door in their communities selling social products. ‘Live Well’ buy their supplies directly from Pharmanova (with no involvement from ColaLife). Relationships like this are key to ensuring the sustainability of the product in the market. In 2017 we expect to see the new USAID DISCOVER-Health project engage in promoting Kit Yamoyo nationwide; vital to fill the gaps where our funded KYTS projects are not operating and where supermarkets fail to reach. Finally, as we say every year . . . a big thank you to everyone who has supported ColaLife throughout 2016. We are making great progress. We couldn’t do it without our supporters. As the song goes: you are the wind beneath our wings!